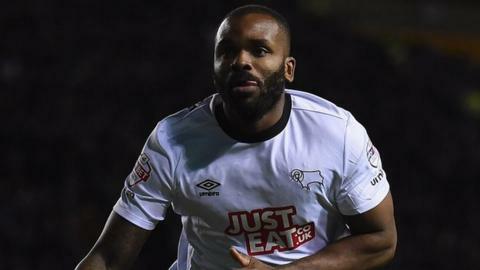 Darren Bent's fourth goal in five games earned a point for Derby and knocked promotion rivals Bournemouth off the top of the Championship. Matt Ritchie swept in a stylish opener for the Cherries after Yann Kermorgant played the ball into his path. Callum Wilson fired in to give Bournemouth a half-time lead, before Bent - on loan from Aston Villa - scored from a Simon Dawkins cut-back. Meanwhile, Middlesbrough, who trailed Bournemouth and Derby by one point before play, took advantage of their rivals' draw to go top of the table with a 2-1 win at Blackpool. Bournemouth showed why they are the country's top scorers by taking the lead with their first meaningful chance. Bournemouth's tally of 64 league goals is the highest of any team in England's top four divisions this season. Home goalkeeper Artur Boruc made a terrific save to stop a near-post volley from Bent - on for the injured Martin. Wilson restored Bournemouth's advantage in the final minute of the half, ripping a right-foot shot across Grant into the top corner after Kermorgant had worked tirelessly to chase a long punt up field and keep the ball in play. Bent silenced the home fans in the 67th minute to earn a point - again showing Aston Villa boss Paul Lambert what he is missing by sending him on loan. "We were below our best. We were not as sharp and positive as we usually are with our passing. "In the end, even though we scored two great goals, the fact we did not get beaten was positive. "It is a learning curve and I back the team to come back stronger for it. If we could have played anywhere near how we can the result would have been different. "The next stage for us is to put our stamp on our rivals. I don't think we have done that against the sides we will be battling with at the end of the season." "Darren Bent has come on and showed his quality. Losing Chris Martin was huge and we had to change things around but Darren gave us something different. "He has had to be patient and wait for his chance but he will get the opportunity to play some games now. "The game was a credit to both clubs and I thought we were magnificent. We showed great character to come back twice. "Today was a big game. We handled Wembley (last season's play-off final) which was also a big game and should have won and credit to the players for coming back from that and going again this season." Match ends, Bournemouth 2, Derby County 2. Second Half ends, Bournemouth 2, Derby County 2. Substitution, Bournemouth. Brett Pitman replaces Matt Ritchie because of an injury. Attempt missed. Tom Ince (Derby County) left footed shot from outside the box is high and wide to the left. Assisted by Jeff Hendrick. Corner, Bournemouth. Conceded by Richard Keogh. Attempt blocked. Harry Arter (Bournemouth) left footed shot from outside the box is blocked. Assisted by Adam Smith. Will Hughes (Derby County) is shown the yellow card for a bad foul. Corner, Derby County. Conceded by Charlie Daniels. Corner, Bournemouth. Conceded by Jake Buxton. Attempt missed. Matt Ritchie (Bournemouth) left footed shot from outside the box is high and wide to the left. Assisted by Harry Arter following a set piece situation. Attempt missed. Simon Dawkins (Derby County) left footed shot from outside the box is close, but misses to the left. Substitution, Bournemouth. Shaun MacDonald replaces Yann Kermorgant. Attempt missed. Will Hughes (Derby County) left footed shot from the right side of the box is close, but misses to the right. Will Hughes (Derby County) wins a free kick on the left wing. Hand ball by Andrew Surman (Bournemouth). Goal! Bournemouth 2, Derby County 2. Darren Bent (Derby County) left footed shot from the left side of the six yard box to the top left corner. Assisted by Simon Dawkins with a cross. Attempt missed. Callum Wilson (Bournemouth) right footed shot from the left side of the box misses to the left. Assisted by Harry Arter. Attempt blocked. Tom Ince (Derby County) left footed shot from the right side of the box is blocked. Corner, Derby County. Conceded by Steve Cook. Second Half begins Bournemouth 2, Derby County 1.